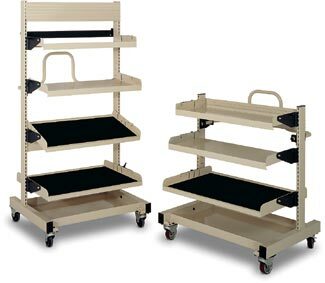 MTS Rolling Carts are heavy gauge mobile platforms that feature two slotted vertical uprights for attaching shelves, parts cup holders and other accessories. The slotted uprights allow an unlimited variety of configurations. The ergonomic guide handle accommodates the widest range of user’s size and strength. The slotted uprights allow an unlimited variety of configurations. The ergonomic guide handle accommodates the widest range of user’s size and strength.